BookBairn got a new pair of shoes this week - they are gold and have butterflies on them (they are for a couple of weddings we are going to this year) and she genuinely loves them so much she wanted to wear them in bed. There was almost a toddler tantrum when I made he take them off. She has been practising her dance moves whilst wearing them. She is going to be a shoe-girl just like her mummy! Not only does she adore her new shoes, she fascinated by a new book from the Favourites Shelf: 'So Many Feet' by Nichole Mara and Alexander Vidal. When this book first arrived from the publisher I will admit I said to Daddy BookBairn, "a whole book about feet? Sounds a bit boring" but I will also admit I was completely wrong! This is a great non-fiction book about all sorts of animals and their different feet. From the slow feet of the giant tortoise to the fast feet of the ostrich, from the dancing feet of the shovel-shouted lizard to the hanging feet of the sloth, from the thumping feet of the elephants to the soft feet of the tigers: who knew there were so many variations of feet in the animal kingdom? Starring sixteen animal species, each page introduces you to an new adjective to describe their feet followed by a sentence explaining the special properties of them. And the final page asks the question: "what can your feet do?" and BookBairn just loves this part! She tells me her feet can dance and then shows off her signature dance moves. The illustrations are incredibly appealing too. Each page takes a different colour to be the centre of the colour palette and keeping simple shapes and shadows for the background, the animals and their feet really stand out. The style of illustration is also really interesting with lots of straight lines and simple details: they almost look like stencils. They certainly appeal to BookBairn as we've read this one over and over and it's even snuck its way into the living room several times for daytime reading too. This is a great non-fiction book for little readers, a genre which I'm glad to see is developing beyond the traditional first word primers, which are important too, but for bright sparks, like BookBairn they don't have much longevity. 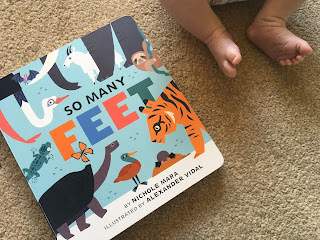 Wee learners are never too young to find out about the world around them if it's done at their level and 'So Many Feet' is pitched perfectly for toddlers who want to know a little more about animals and their features. A great addition to our library! What can your feet do? For now I'm taking a moment to put mine up and enjoy a little rest whilst BookBairn dances her cares away! 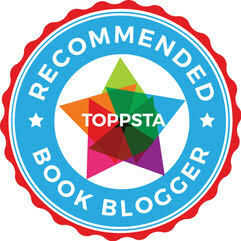 Such a great book and she reads it so well! I love listening to BookBairn read this book and the different voices she uses for the different feet. My feet tend to stomp. What can your feet do? My feet like to be put up with a cup of tea and a good book! Oh yes we have a pair of yellow duck wellies that are too big for her but she still insists on wearing them! Much more fun than the title and really informative too! My son would have enjoyed this book at that age. It's the sort of book we'd probably get from the library rather than buy as we'd want to move onto something else the next week. Yes, I can appreciate it's maybe more of a borrow than a buy book but to be honest we've now read this one over 50 times and I would worry about returning it to the library and not having it when she asks. We have that dilemma with Please, Mr Panda - it's a library book we just want to keep! Oh the book problems we have! She's a book and a shoe girl! Don't know where she gets that from! *Totally her mummy's girl!